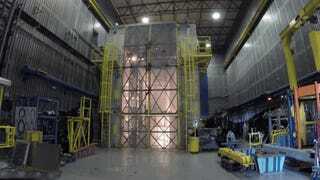 Sometimes, all a day really needs is a nice video of rocket components exploding during stress-testing. Why, hello there Space Launch System! Did your booster composite case get over-pressurized with water to test how the materials would withstand launch-strain? Perfect! The video covers the same test in real-time from four camera angles. I must say, while I appreciate the up-close and personal water droplet shrapnel, I'm absolutely fascinated by watching water spill across the test chamber in the final view. Tip via Jason Davis. Top image extracted from clip by Mika McKinnon.